A lot of runners welcomed the vibrant look of the Nike LunarTempo 2, and they said that it made the façade very appealing. Many reviewers appreciated the look of this shoe, which resembled a knitted material that wrapped around the foot like a cloth. The Flywire cables gained some fans who wanted the upper cover system to feel more snug and secure. Several testers pointed out how comfortable their experience had been with this version. Runners noticed the plush underfoot support given by the Lunarlon foam. This running shoe felt adequately lightweight for many of those who have tried it. There were consumers who were able to wear this shoe for many types of activities, and they reported no problems with it. Some reviewers stated that this shoe was able to last long, that it resisted wear and tear even after many uses. Some runners felt that the mid-sole unit of the LunarTempo 2 was a bit stiff. Others commented that the shoe was half-a-size smaller than what they were used to. A tester reported that the threading on the back of the shoe came apart after only one use. The Nike Lunartempo 2 is a lightweight comfortable trainer that can be used for daily running. It is a good shoe but it does have its set of problems. After using this shoe for about 4 months as a trainer here's my verdict. The Lunartempo does perform as I expected. A lightweight trainer that can also be used in competition. Running in this shoe hasn't been exactly a joy but it has been quite enjoyable during my last few runs in them. Buying the shoe, I had the impression that the shoe would have much more cushioning from the relatively thick midsole it has. When I started running in them, it felt that I was running on the pavement. The midsole was extremely stiff and I did not enjoy the run at all. Also, this shoe is definitely a snappy shoe.The full-length lunarlon foam gives this shoe a consistent responsive feel. After breaking into this shoe, running in it has been a joy. Every step feels quick. Overall the Lunartempo is quite a comfortable shoe. I have had no major issues running in this shoe besides the break-in period where I developed hotspots.This shoe is nice and breathable which is appreciated as I usually run in humid weather. In addition, the lack of welded overlays on the shoe makes the upper stretchy that allows it to conform to the shape of my foot. That gives my foot the ability to move freely. I do feel that the break-in period on this shoe is quite long as it took me some time before it felt natural to run in. This shoe like the majority of running shoes for casual wear as well. The addition of reflective strips on the back of the shoe is something that I do appreciate. Having reflective strips increases the reflectivity of the shoe that allows me to run at night without having to worry about drivers being unable to spot me. The sizing of this shoe is smaller than what I am used to. As I have a slightly wider foot, I had to size up the shoe by half a size. This gave me a problem as it caused the heel cup to be loose and it constantly slipped when I run. To fix this problem I had to wear thicker socks. The flywire cables on the side of the shoe allow it to have a more customizable fit than other trainers I have. Also, the lockdown the shoe has is much more superior as compared to other shoes such as the Adidas Boston Boost. The shoe is definitely a lightweight shoe. Weighing in at 212g this shoe is much lighter than some racing flats like the Mizuno Wave Hitogami which weighs in at 224g. I do feel that the weight definitely contributes to the reason why the shoe feels so fast. The full-length Lunarlon foam midsole gives it excellent cushioning. It's is a bit stiff trainer though in my opinion. Due to it being a more responsive shoe, I have made it into my go-to shoe for faster workouts and tempo runs. After running regularly in this shoe for the past 2 months, I feel that the outsole wear on this shoe is not significant. The placement of vulcanized rubber on parts of the outsole that experience more usage, such as the front and back of the shoe helps to reduce the amount of visible wear. The Nike Lunartempo 2 is a shoe that would suit runners who are looking for a responsive and cushioned trainer that will perform at a variety of workouts from 20-minute tempos to long runs. I can definitely see myself racing in this shoe in the future. While it is a heavily cushioned shoe, it still feels very light. For many runners, including myself, finding a running shoe that looks just as well as it preforms can be difficult. 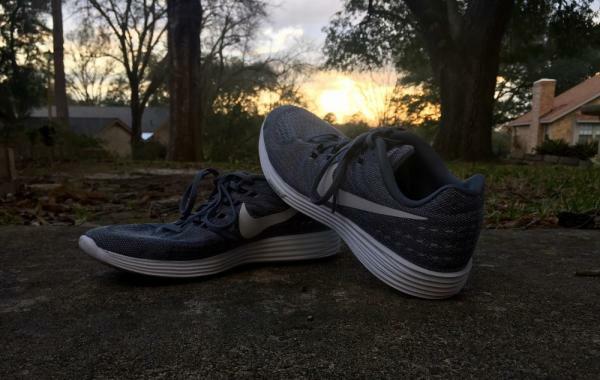 For this review, I chose the Nike Lunartempo 2 because of its stylish looks and ability to perform the way a proper shoe should. Fortunately for Nike, there have not been too many problems with their shoe designs in the past, nor do they with the Lunartempo. At first glance, the Lunartempo is an average, good looking shoe. However, with further examination, one can see how the flyknit, flywire, and grooved design on the outer sole show the true beauty of this shoe. Many shoes deemed “supportive” tend to feel over cushioned and heavy. However, Nike has created the Lunartempo to be lightweight and comfortable. 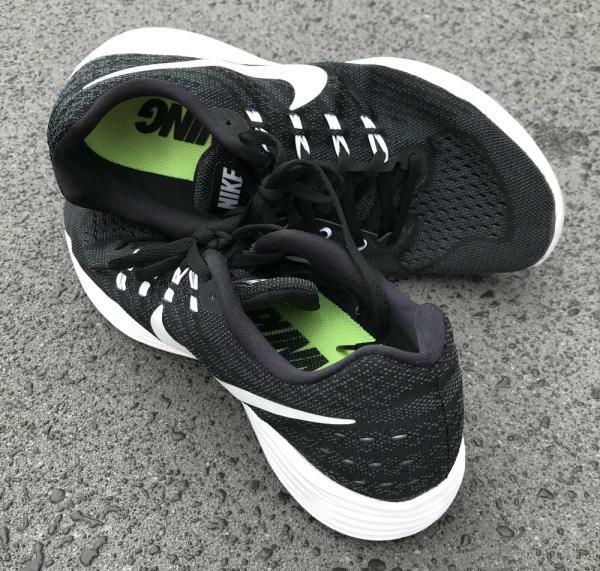 The Lunarlon outsole is relatively thin, and the heel to toe drop is around 7mm; this is generally good for runners that prefer a low-profile shoe. While the Lunartempo is supportive, it does have its limits. Road and track running feel almost effortless; however, trail running can prove to be more difficult. Trails that are composed of sand, dirt or small rocks are generally okay. However, trails with large tree roots and rocks can create a not so comfortable experience. Overall, the Nike Lunartempo 2 is a comfortable lightweight shoe that will not fail to please. I have not had any trouble with the shoe falling apart, however, it has flattened substantially. The light blue Lunartempo pictured has over 300 miles logged and has been through both rain and mud, however, the flywire and flyknit remain intact. Like every shoe, the outer sole bears most of the brunt, so wear is inevitable. While this cannot be prevented, Nike has taken steps to extend the life of the shoe. In my experience, the Nike Lunartempo has proved to handle a variety of workouts and surfaces with ease. I have run repeats as short as 100 meters and as long as 1600 meters, yet the responsiveness is always there. Even in distance and tempo runs, the Lunartempo remains both supportive and responsive. It is almost as if the Lunartempo is a turbocharger in a vehicle. When you want it to go, it will go, without hesitation. Nearing the end of my cross-country season, I decided to run a half marathon, and even with over 200 miles racked up, the Lunartempo did its job. Although I should have bought another pair, I continued with this shoe through track season and had no problems. I have run in nearly eight different brands of shoes, and so far, the Nike Lunar Tempo 2 is the best when it comes to variety and durability. The Nike and I would recommend it to any runner. This shoe is both beautiful and aggressive. While the Lunartempo is durable, it is recommended to replace any shoe after a few hundred miles to prevent injury. This shoe is best for people who prefer a responsive shoe without sacrificing comfort and support. The ride is nice and smooth with a great consistent feel regardless of the speed. Nike brings out very little changes in the 2nd version of the Lunar Tempo. The alterations may be minimal, but they effectively enhance the new model’s performance and appearance. The most visible alteration is a more ostentatious and smoother Nike logo that has great reflective features. Aside from improving the already trendy and sophisticated look of the shoe, the reflective material will be handy during low-light runs. A dash of reflection extends to the dots near the heel. The new mesh is more durable, smoother, and is not as wide as the past version. It is still very breathable while it improves the shoe’s looks and durability. The interior of the shoe becomes more comfortable with a new perforated bootie that is totally separated from the mesh upper. This development helps maintain shoe breathability as well. Since the modifications featured in the Lunar Tempo 2 are very minimal, the fit and sizing are practically the same as the original model. It is reasonably snug in the heel, midfoot, and forefoot. Runners with slightly wider feet may have to go up half a size like they did when they bought the original Lunar Tempo. The widths are D for the men’s and B for the women’s. Available sizes are from 7 to 13 for the men’s and 4 to 11 for the women’s. There are numerous rubber slabs all throughout the outsole that provides both traction and durability on the road. Nike also uses these waffle and moderately-sized pods for a bit of cushioning as this is a Lunarlon foam that is directly connected to the midsole. There is carbon rubber placed in strategic areas where wear and tear happens upon landing and before takeoff. The Lunar Tempo 2 gets its really great cushioning from an oversized and full-length Lunarlon foam. It is a foam that is more resilient and significantly lighter than Nike’s regular midsole foam in the Phylon. This midsole material is also used in the Downshifter 7 and other Nike running footwear. The upper mesh is a bit tightly-woven than the past edition, but is more durable without compromising breathability. This entire upper is a bootie-style fit that truly wraps the foot. A very prominent Swoosh logo with major reflective material is indispensable in areas with less than ideal visibility. The Flywire cables work through the laces to hold the foot in comfortable security. Added comfort is provided by the foam in the collar and foam lining against the laces.